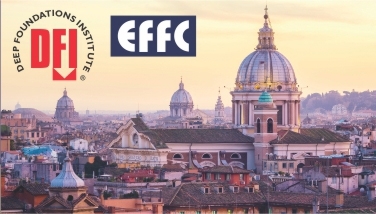 Registration is now open for the 2018 DFI-EFFC International Conference on Deep Foundations and Ground Improvement at Sapienza University, June 5-8, 2018. The conference explores the challenges of upcoming urban infrastructure megaprojects and highlights modern technologies and techniques available to overcome these challenges. Client representatives will present upcoming or in progress megaprojects such as Rome Metro C, Fehmarn Belt, Gran Paris and the Chennai Metro as well as the water infrastructure challenges in Italy and worldwide. A panel of clients will discuss award mechanisms, contractual challenges and risk management. Other highlights of the conference include the Tuesday, June 5 pre-conference day workshops and panel discussions covering working platforms (focusing on the state of the practice for design, construction and contractual practices for working platforms); continuous-flight auger and drilled displacement piles (comparing practices in Europe and North America); and panel discussion on Tremie concrete (presentation of recent research by DFI and EFFC and the updates to the second edition of the Best Practice Guide to Tremie Concrete for Deep Foundations-download the first edition by clicking HERE); the conference kick-off Welcome Reception in the exhibit area; the Wednesday, June 6 Conference Banquet; the DFI John Mitchell Lecture presented by Prof. Michele Jamiolkowski on “Geophysical to Geotechnical Design;” a Young Professional and Student Mentoring Forum; Friday, June 8 optional post-conference tours to attendees’ choice of the Catacombs, Rome Metro C or Civita di Bagnoregio; and an Accompanying Persons’ Program.